Wow so you want to learn defence. Cool ! Ok Jembru here we go. Basic defence hold back or neutral to avoid high and mid moves. For low down back or just down of down forward for parry. And side stepping is of 2 types. Left side and right side. Some moves can be avoided by left side step some by right. Ex bryan fury's u/f 4 hits you if you side step in fore ground ( towards the screen or Yoshi's right ) but if you side step to left ( into back ground or away) it totally whiffs off. And then there is side walk which whiffs strings. May be its better you watch level up your game for better understanding. Oh this side step is also referred as tracking. And you have classic back dash i.e b,b but after back dash you can be hit so you gotta cancel back dash with down back. Search in you tube to how to do back dash. Oh by the way there is side step cancelling also which is very sweet and i didnt learn O.O Damn. *reads the tile of this thread* Ah! This seems like the place for me! Welcome Aozame!! Well, I have seen you play and I can tell you quite honestly that I am a whole different league of noob :p At least you know the basics ^^ Still, you're welcome to join us in here. Maybe you'll learn something and maybe you'll have some noob tips of your own. I'm also keeping a noob blog, if you're interested. Although I can't be bothered to find the link right now (I have to get ready for work >.<). Thanks vijay, yeah, we can add one another on facebook. Although I never use it for chat. I only chat with gmail or msn. Mainly msn. Of course, I can't give my msn out here though as it's public. Oh and AKfan almsost took my T6 online virginity last night!! But due to internet problems it didn't work. So I'm still a T6 online virgin for now (lol, and I've had the game almost a week now, I'm SUCH a coward ^^). I did it! Thanks for being more explicit (sorry to use a stupidly big word but I can't think of another way to say that right now, it's late and I have Tekken-fatigue -oh good lord, another big word. I have big word tourettes). Where was I? Oh yes. I made it work thanks to your help. It was simply that my TV is so small that some of the writing can't be read at all. I didn't even see the circle button when it said to press select. That was the problem. Also, sorry I have been gone for a few days, I was curious to see how YOT survived with out me, turns out, it didn't. Anyway, I got my fist perfect round on arcade mode against Jin yesterday. No, I don't mean my first perfect round ever... I mean my first against Jin on stage 8. Thanks to everyone who helped me to get from total idiot to boarderline learning difficulty, on this game. Soon I hope to reach the 'not bad for an 8 year old' level of play, then I can move on from there. Seriously though, thanks guys, and those who supported me via msn, thanks even more!!. HUGS!!! Glad I could help.there is also position reset button (select + x button) you can use. Practise mode is really useful. Oh by the way Tekken was so boring without you. I mean 10-15 members logged in daily but no one posts. If you had been gone for one more week it would have sucked more. Even angel boy disappeared. Tell that roommate of yours to give you the bigger T.v :p i told you to kick her out. ^_^ you are just being too nice. Oh and whats a word tourettes ? One noob question time how do you delay b1,2 at walls ? I mean do i have to hold back or can i let go of back. Pls help cos i seem to be getting no delay what so ever . Thanks. No no, I don't live with that girl yet ^^ After I came back from Germany, I stayed with my mum while I looked for work. Then, just before I started my new job, SHE lost her job. Now I have to stay here to help my mum pay off her bills and stuff as I am the only one earning. As soon as she gets a job (or February, which ever comes first), I'll move in with my friend. THEN, I get to use the giant awesome TV screen. Tourettes is a disorder whereby the sufferer has involuntary motor ticks, often accompanied by verbalisation, which is completely out of their control. For some reason, it's often swear words, so the disorder gets a lot of fame from that. I was trying to say, I just can't help using big words sometimes. Thanks for missing me. Now let me highlight your question so people dont scroll past it and ignore it. # vijay_kumar_cute : One noob question time how do you delay b1,2 at walls ? I mean do i have to hold back or can i let go of back. Pls help cos i seem to be getting no delay what so ever . Thanks. Maybe I'll jump into this thread as well. Personally, I keep on holding "b" in b+2,1, but I think it can be as well released. The delay... is very easy, but I can understand that at first time it might be problematic. Try to think in a scale of "frames". The delay is in fact very tiny. First, do it without any delay, then, try to delay it a tiny,tiny bit, then even longer... Practice is the best thing. As for telling one move from another, seeing that a move hits low is the easiest thing. Then, high or mid is more difficult, mainly because many times Namco made a move MID, but then changed their mind and switched it to high, maintaining old animation. but more or less, especially among older moves, it's easy to tell high from mid. Anyways, if you want to play and win, you'll have to go through every character's movelist... there's no other way. Thanks for joining in Tenshi. A thread like this wouldn't be the same without you! Yeah, I kinda suspected that learning the moves of each character in turn, is going to be the only way to become good at this game. For now I think I'll stick to mastering the basics though. This is a little suggestion aimed at everyone who contributed in here, on msn or on my blog. I had a little brainwave while chatting to Angelboy a few nights ago. I thought as there is no Yoshi FAQ yet, how about I try to gather up the information, hints and tips, people have offered? I doubt I have the time or expertise to put it into any logical order, so I would need an editor (or a few) who can pad it out and tidy it up. But until someone has the time to write a full FAQ (it takes soo long, and we're already being threatened with T7), I figured it would be better than nothing and others might benefit from it's creation. Obviously, I'll only include people's advice if they say it is okay to do so, and we can put everybody's name on it, like a joint effort. Well, my name can stay off because all I'm doing is collecting like a little magpie, but the rest of you will get the credit you deserve. Let me know what you think and if anyone would be willing to edit the stuff for me, please contact me either here, via PM, msn, by pigeon, message in a bottle, smoke signals or whatever. Hmm, you can put up things together, why not. FAQ needs a willing person to do the work... I currently don't have much time. I'll also try to put the required code modifications to our current FAQ system, and we'll be able to start rocking that section. # Tenshimitsu : Hmm, you can put up things together, why not. FAQ needs a willing person to do the work... I currently don't have much time. so how will we do this, will we make a seperate topic where we'll bundle all our knowledge and skills? Sorry I went quiet for a bit. Been crazy here.. the big move is getting close and then there is all that Christmas stuff happening. So yeah, I was thinking of literally just collecting all the advice that I have received together in one place and was hoping someone wiser than me could organise it and add the technical stuff. Yes, you would be ideal for the job Angelboy, but do you have the time? I'll doubtlessly be busy once I move too, but when I have the time, I'll try to help if you need me to. Not that I'll be much use besides creative input. You know where to find me if you need me so let me know how you feel about this. Ooh, I forgot about the FAQ thing. Whatever happened to that idea? Still wanna do it Angelboy? Thanks for the warm welcome, Jembru! As for myself, I am most definitely a n00by player. But I'm really excited to learn. I've been practicing the basics and some juggles. Hopefully I'll soon have that magical moment when everything just clicks. I've also started playing with an actual arcade stick, which was weird at first. I've found it to be way more fun, though. Well, here's a n00b question if anyone wants to answer it for me. I'll be reading people's opinions and lists of properties for moves, and I'll come across terms like "-15f on block." Sometimes it'll just say "-15" without the f. I'm assuming the "f" stands for "frames," but I don't really know what that means exactly. Would anyone care to ellaborate? OMG, I actually just starting using sidestep attacks more! 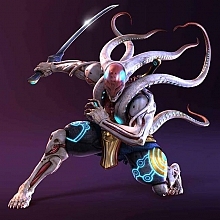 :D I was messing around on the PSP yesterday and I really like Yoshimitsu's SS+1, if I remember correctly. He kinda ducks down and does a sword back of sorts. I don't know if it's really effective, but I like it. About the frames, what do they mean when they say something like "-15f on block"? Like, I read it as "negative 15 frames on block," but what are negative frames?